"Then it's a good thing I'm no coward!" Xena is a warrior princess. She's combat capable and has a heart that won't let the innocent be harmed. In Xena #1 from Dynamite Comics, she's making her way through the countryside with those same traits. The issue is written by Meredith Finch, illustrated by Vicente Cifuentes, colored by Triona Farrell and lettered by Cardinal Rae. Xena is a character who is pretty well-known and Finch doesn't really look to change that notion at all with her take. In fact, the majority of the issue is spent establishing Xena's relationship with Gabrielle as Finch uses a chance encounter to set them on the same path together. Outside of that, however, there's not much revealed in the way of an overarching plot save for a mysterious character lurking at the end of the issue. Finch's dialogue is pretty slick in its approach and is relatively lighthearted throughout the issue. The end of the issue ensures that Xena is on a path, even if Finch doesn't really completely reveal that path at the outset. Cifuentes does a solid job on the artwork. The concise linework gives each character definition and heft as Cifuentes differentiates each of the robbers well so as to not confuse the reader. Xena and Gabrielle are illustrated in a way that evokes the familiarity from their appearance on the show. Cifuentes also handles the action sequences very well, in that he emphasizes the conflict with an eye towards convincing the reader that characters are in peril at times. Farrell's colors are well chosen and tap into the forest setting by leaning on greens and browns. 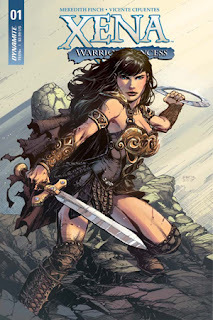 Xena #1 is a return to a familiar character buoyed by that character's strengths. Xena is cool and fearless in the face of danger, willing to jump into the fray if it means helping the helpless. Finch's script is anchored by making sure all her traits are on display as a means of carrying the story. Cifuentes' artwork is a good fit for the book and shows the characters in a way that's readily familiar to the readers. Xena #1 will appeal to fans of the character as she's a no-nonsense warrior on a continuing mission. Xena #1 is available now.